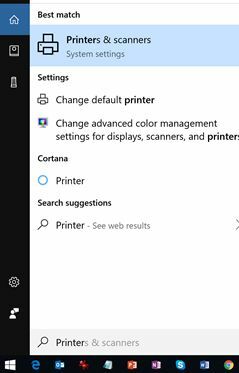 This article provides step by step instructions on how to setup and configure a new Printer in Windows 10. 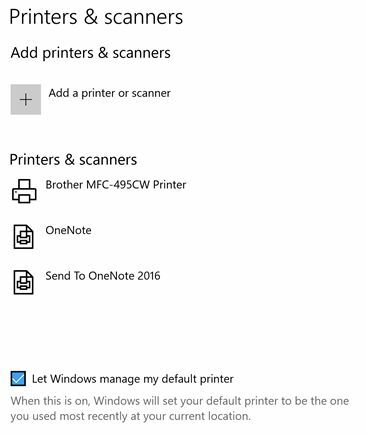 This article provides step by step instructions on how to add a printer in Windows 10. Enter WIN+S to open a Windows Search Box. Type “Printers” in it and you will see Printers & Scanners in the search results. On the Printers & Scanners window, you will see a list of existing printers and scanners. There is also an option to add a printer or scanner – “Add a printer or scanner” with a + sign. The above action will scan your new printer and show it in the list. Click on the “Add device” button. Note: You need to make sure your printer is connected to the computer or is set up on your wireless network. If you do not see your printer in this list, it must not be on or it is not available on the wireless. Windows 10 will automatically set up your new printer as the default printer. By default, “Let Windows manage my default printer” check box is checked. See below. Note: If you have multiple printers, and this is not your default printer, you can uncheck it and set other printer as your default printer. Watch this video to learn more about how to set up a new printer.